Most home offices get a very bad rap. Part work space, part storage area, part gym, part spare room, part junk drawer, many home offices have all the charm of an actual office cubicle – with none of the efficiency. But it doesn't have to be that way. With a good design and some thoughtful furnishings and fittings, you can create a comfortable, productive, and attractive workspace. You can put the "home" back into "home office." You don't need an entire room in your home in order to have a great workspace, says Luis Suarez, owner of Alaska Premier Closets. However, even a small or shared space needs to be properly conceived and installed. In fact, he says, the smaller the space, the more thought that needs to go into it. Good planning, efficient storage, and a little creativity can result in a functional and aesthetic work area. And consider how much space you really need, says Luis. A recent client had room in her home for a full-fledged, room-sized office but chose to convert a walk-in closet instead. "She likes smaller more intimate spaces," he says. "We tore out shelves, and put in a counter and cabinets," he says. In other homes with small children's bedrooms – "barely big enough for a twin bed and a night stand" – the company has utilized half a closet to create a homework space. The other half is still used for clothing storage. "Where we really shine is looking at small spaces and maximizing people's real estate," he says. A spare bedroom can be an incredibly versatile space, especially with the addition of a wall-bed that can disappear when it's not needed, says Luis. "Out of all the things we do, the wall beds get people the most excited," says Luis. Office by day, bedroom by night, this space-saver provides a lot of bang for the buck. If your office space needs to double as a home gym or a laundry area, using curtains to block off those areas can be a really attractive option, says Linda Amedy of Elemental Design in Anchorage. "Choose some beautiful fabrics in your favorite color," she suggests and turn a drawback "into an asset." When it comes to furniture, analyze your personal needs and work habits before you buy anything. "I need to spread out," says Linda, "so for my desk, I needed length but not width." Her solution was decidedly out of the box. Converting two flat doors into a desk provided her with the proportions she needed. As for the two holes where the door handles would be, one neatly channels all her computer cords and the other holds a vase for fresh flowers. Alternatively, says Luis, if you're the type of person "who creates piles and tends to spread out too much, you should design a space that doesn't allow for it." Reduce the counter space and pare down your surface areas to what's absolutely needed, he suggests. Luis recommends a slot wall system of storage that is flexible and customizable and keeps supplies off your desktop. File folders, pen holders, paper clip holders, and even power strips and other plug-in items can all be stored neatly and accessibly on your office wall. Rolling carts can hold bulkier office equipment like printers, fax machines and CPU towers and can be slid under desks or behind doors for a clutter-free floor. Bill Ure of Treeforms Furniture Gallery thinks people should purchase office furniture with the same care as the rest of their home's furnishings. "People want their home to look like a home," he says. "They want furniture with warmth, and a choice of colors and finishes," he says. 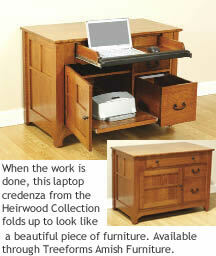 Treeforms solid hardwood furniture is designed to fit in with the rest of your home's décor. 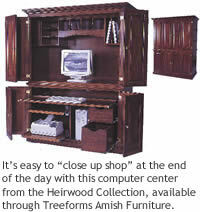 Cabinets are designed to hold computers and printers and then "fold up completely to look like a nice piece of furniture when your work is done," says Bill. "It's warm, comfortable and efficient." Bill also points to the longevity of the store's Amish-made furniture. "Office furniture, like any furniture, should be built to last." And because people are spending more and more time at their computers, says Bill – both work time and personal time – many people are designing offices to incorporate a sitting area where you can relax but still have access to your electronics. "With so many people using laptops and wireless computers, you can easily sit in an easy chair and get things done," he says. "Not everyone needs a big U-shaped desk." And remember, in your home office, you're the boss, so make the space your own. "You want this to be a space you enjoy spending time in," says Linda. "Put up some artwork that you love or some pieces that give you motivation," she says – whether its family photos, or a pair of vintage snowshoes. In her office is a display of magazine clippings that inspire her, a vase of twigs that lend a sculptural and textural element to the space, and walls in shades of cream and orange – her favorite color. Color is so important, she says. "Bring in your favorite shades – ones that make you feel good." Green, she suggests, is both "calming and energizing at the same time." Luis agrees. "Color can bring a lot of artistic value to a room but it doesn't cost much," he says. "This is where a client is can be the most engaged." You can have a bright pink wall with lime green countertops, he says, then add colored LED lights if you want your space to feel youthful and bright. The sky's the limit. While every office he designs is unique, his clients share a similar reaction, says Luis. "They all say: 'Why did I wait to do this? Why did I wait?' 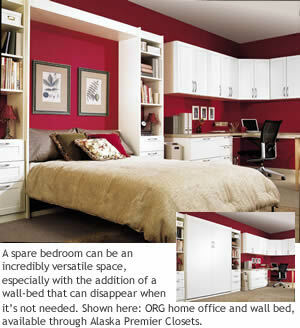 " So if your home office is the last room in your house where you want to spend time, what are you waiting for?